If you are planning to climb the highest mountain in Germany this summer and if you happen to own an iPhone, you can download a new hiking app that we submitted to the App Store a few days ago – for free! Our outdooractive.com marketing team decided to only include one tour in the app – but this is the most popular and also the easiest route to climb the Zugspitze. From Garmisch via Reintal onto the top of Germany. However, the real highlight is that the app also includes the best outdoor map of the Zugspitze-Wetterstein area that is available at the moment. You have a great level of detail, including contours, hiking tracks, rock formations, ski lifts and heaps of other cartographic goodies. 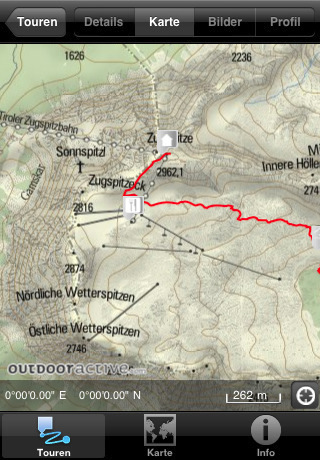 And needless to say that you can also use this app to go mountain biking in the Zugpspitze area. The app will show your current position and if you plan out where you want to go before, you can refer to the map to find out if you’re on the right track. So all you need to do now is wait for the snow to melt. Usually in June or July the conditions are good enough already. Enjoy! Dieser Beitrag wurde unter iPhone abgelegt am 22.2.2010 von admin.